With this particular article I am making it clear I am working towards Volume 11 as a major effort to get something that is actually going to be completed as a volume as soon as possible. This will not be a continuous effort throughout the year but it will be a major focus for the maps this year. At the same time I am refocusing my ambitious schedule that was planned for the year and suggesting it might have to be put out over two or three years. 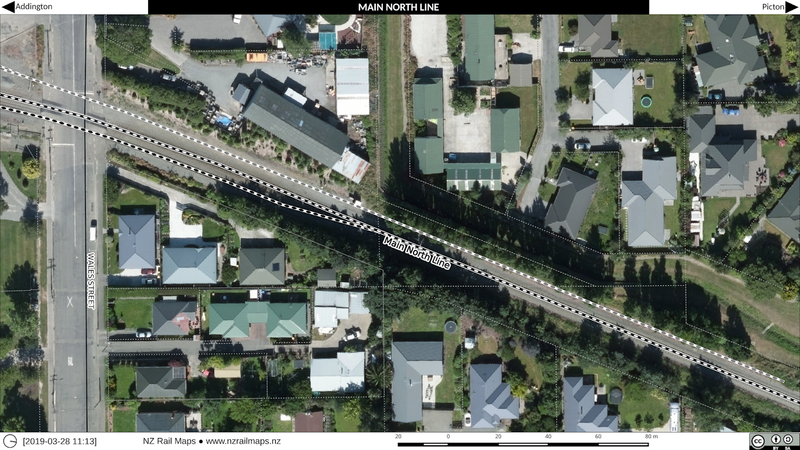 Rolleston all the way through to Timaru is covered by a 0.3 metre aerial layer. At the moment I am downloading all of what is available in that layer for MSL right down to Waikouaiti and then from there all the way down to Dunedin and then Invercargill will soon follow. Mosaic projects have been assembled over the past few days to cover Lyttelton through to Templeton (the limit of 0.075 metre coverage of Christchurch), and from there will cover Rolleston and any other townships that are in 0.125 metre coverage for the Selwyn District, and from there at 0.3 metres heading south. 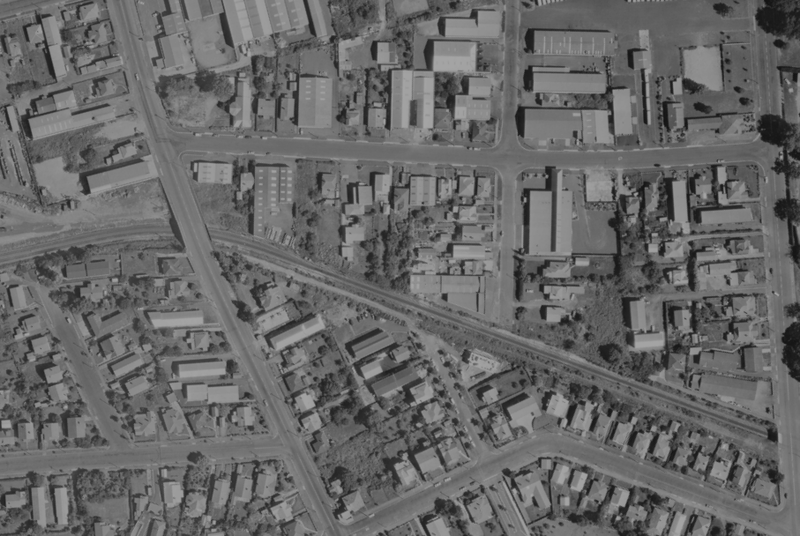 We will be using all available NZR surveys for the stations heading south and to match this resolution the 0.3 metre images will have to be rescaled to 0.1 metre size and segmented mosaic canvas used. Last time I wrote about using linear and segmented mosaic projects and indicated a clear preference for linear. 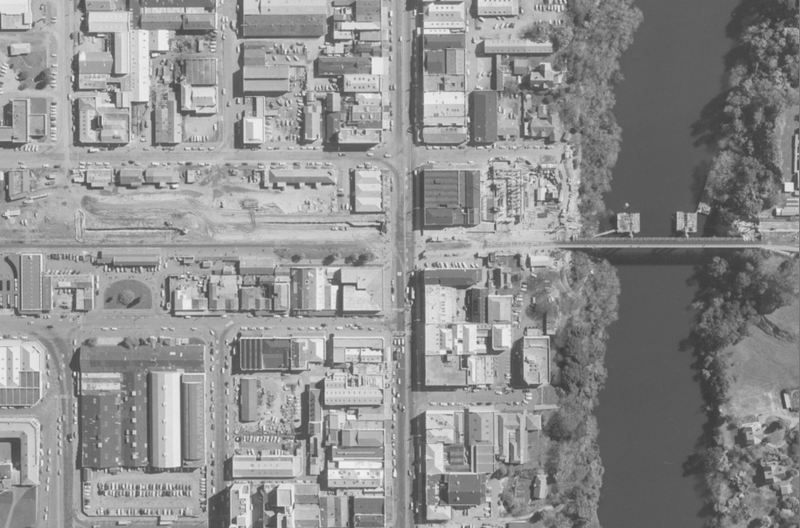 However this is only possible where the base imagery is no more than 0.125 m pixel size as too much detail is lost scaling down the NZR images to match larger pixel sizes. At that point I have to bring in a tile grid to sit in the background of the canvas to provide grid indexes for segments and we don't want to duplicate multiple copies of this grid across a linear canvas because there are too many additional layers. 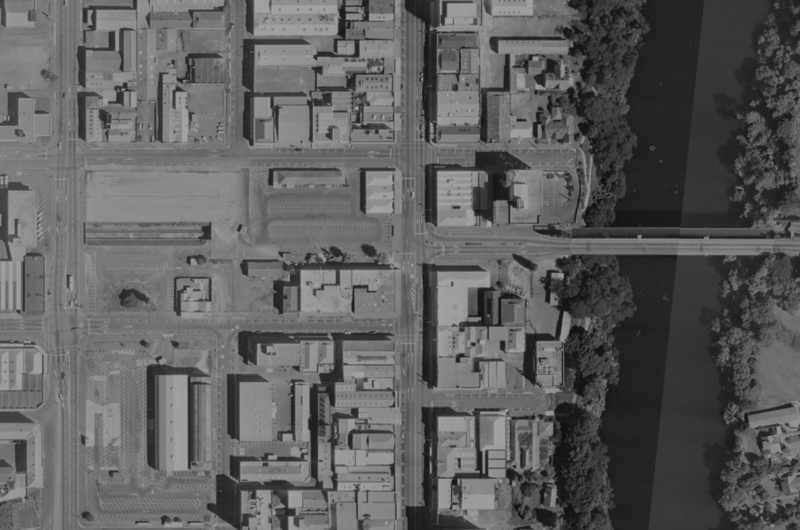 Segmenting is actually OK for this situation because the stations are quite a distance apart, meaning no overlap problems, and therefore there is no benefit to a linear canvas. 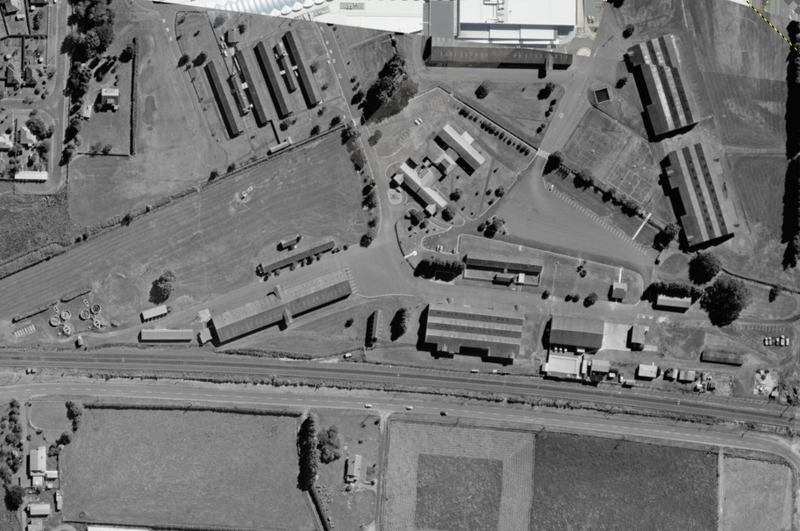 So I am just about to create the first segmented canvas mosaic project in Gimp for Weedons / Weedons AFB / Burnham and maybe a few other stations heading south as well. As one can imagine, completing a volume for a line as long as the MSL is quite an ambitious undertaking and it will be staged out and I will take breaks to do work on other areas as I always do. Volumes 5 and 12 in particular are other areas I want to make significant progress on this year and as previously noted there is the schedule I talked about earlier this year and I will look at the standard of completion for other volumes. 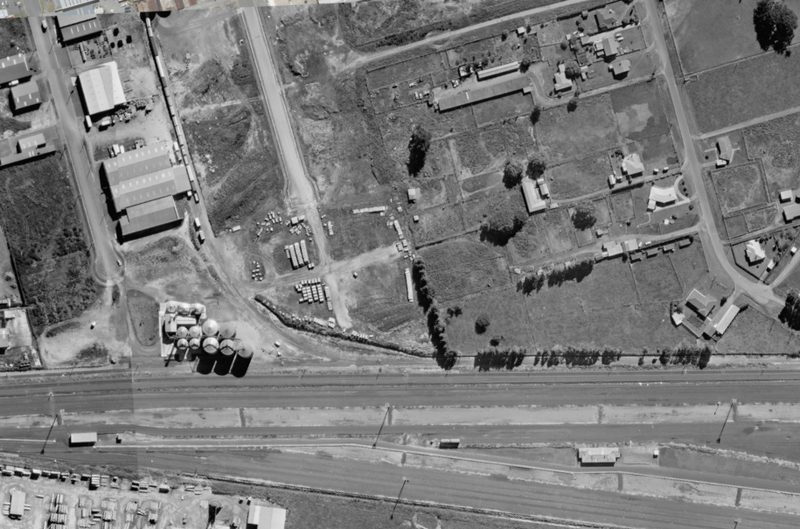 But to get any of these volumes together I have to download all the aerial imagery for the base maps and that is always a big effort and that at the minimum is what is needed to bring the maps together regardless of what level is produced. 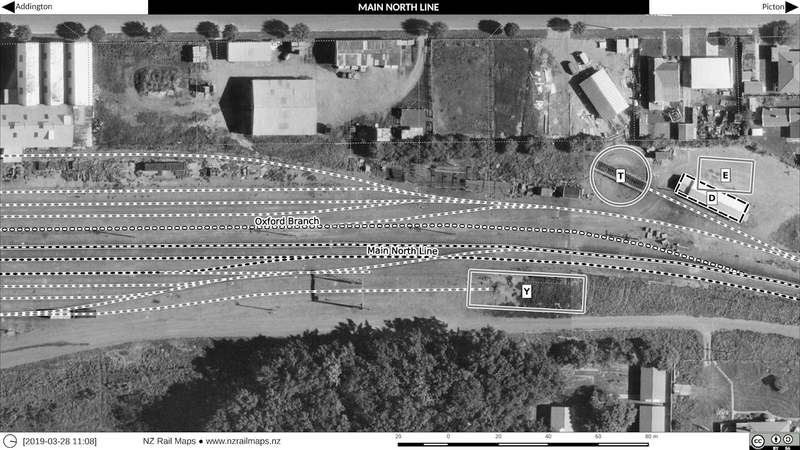 MSL also incorporates previous work done with Methven and Springburn lines and this will be brought in as well. 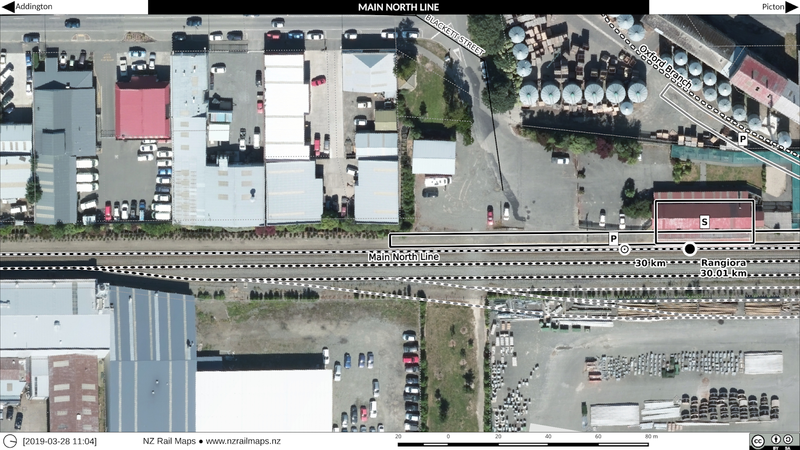 There are no NZR surveys for either line so no issue with having to match NZR survey resolution. 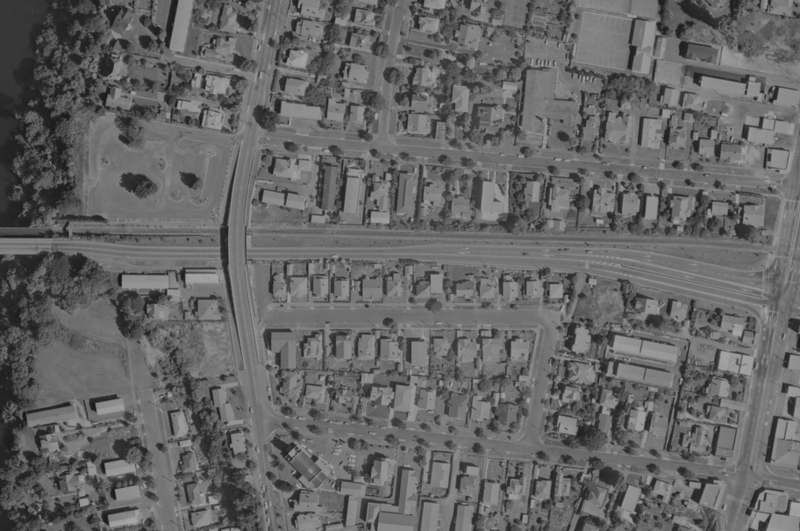 Whilst I am still drawing maps of Dunedin and this work will probably take me until the end of the month to complete, I am working on a mosaic of Hamilton Urban Area (Hamilton to Horotiu) as well. 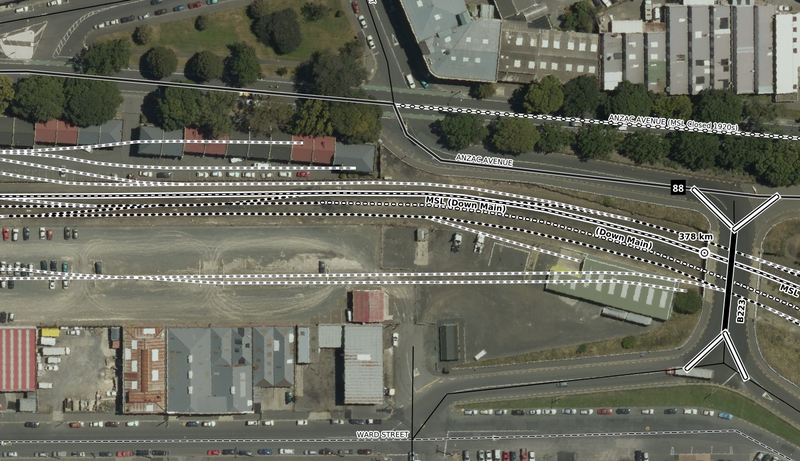 The initial focus will be the Te Rapa hump shunt yard of the 1970s. At this stage there is no plan to do any actual maps, just the mosaic for comparitive purposes but I imagine some maps will come together maybe later this year. These interesting images come from a colour Retrolens survey dated 28 February 1988. 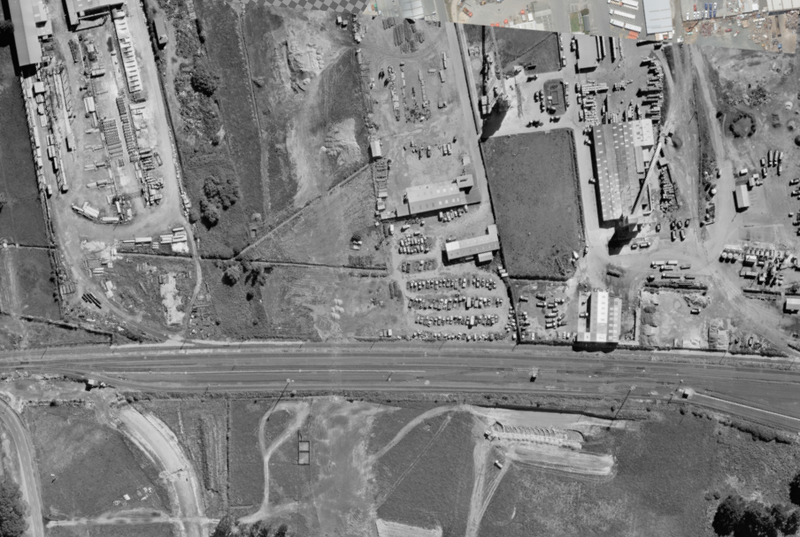 Although I have georeferenced this imagery it is of insufficient quality to be used for map making purposes. 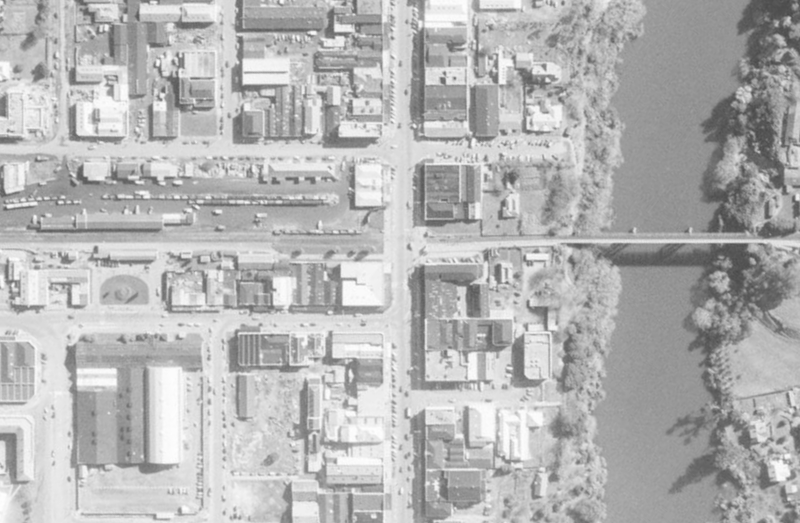 The reasons for this are that it was shot at a very low altitude, only 2000 feet, and therefore must have used a very wide lens on the camera, inducing significant distortion, which can be seen in many of the buildings. 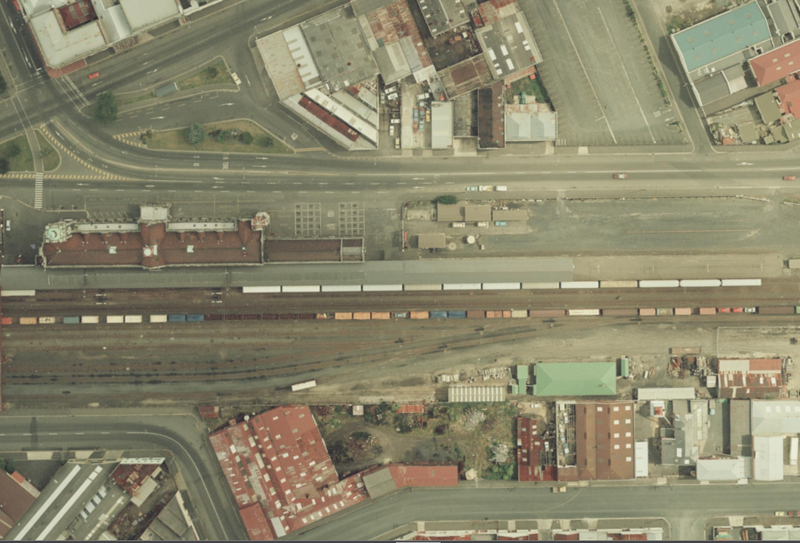 The problem is that this doesn't just affect buildings - it can even have an impact on perspective of track down on the ground and that makes it much more difficult to line up accurately. 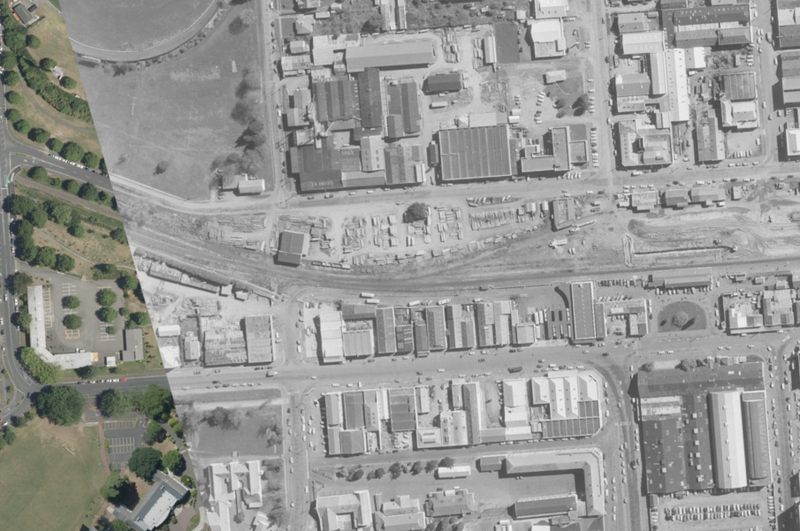 So even though these images cover a small area and have a tantalisingly good scale of 1:4000, about the same as the NZR surveys, the amount of perspective distortion in them is off the scale compared to what I usually work with. 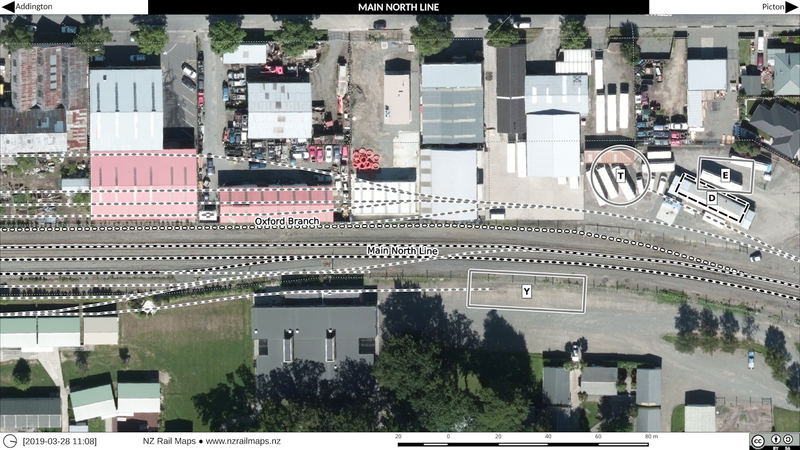 It's enough that working across two overlapping images, there is even difficulty in lining up two sets of points motors that are 20 metres apart. 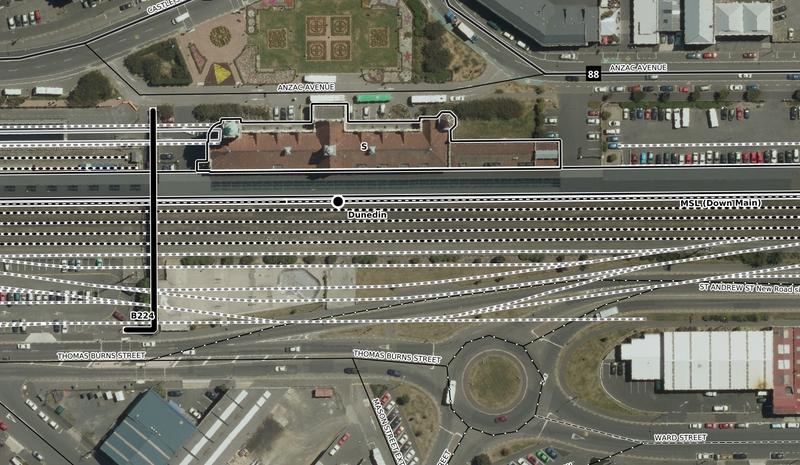 That means that even the track can't be assured of being in the right place. 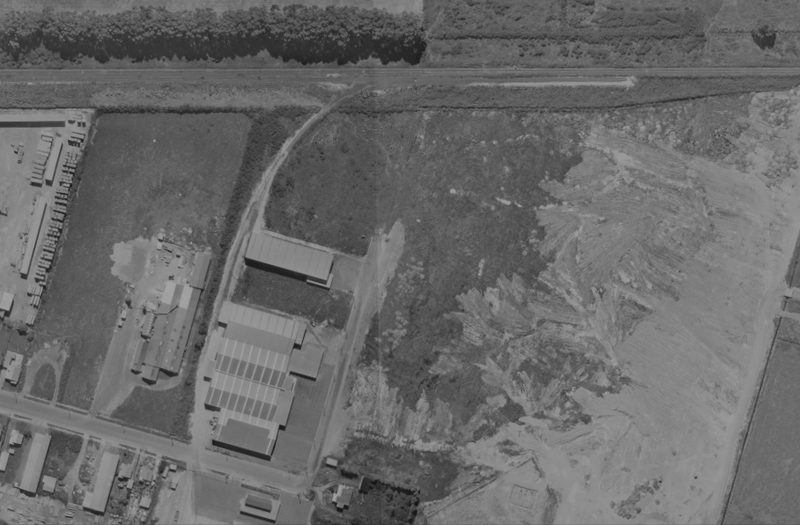 So that little lesson is just to show that not all aerial imagery is good enough even at quite a good scale which this stuff is. 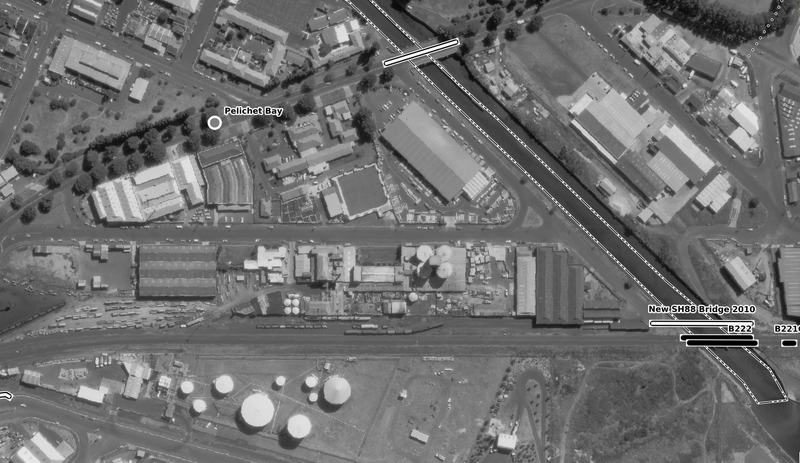 I have put it into the map mosaics and tiles will be made but purely to look at some features on the ground at a point in time (1988) and not to render actual maps - only a small area of Dunedin yard is covered by this survey anyhow. 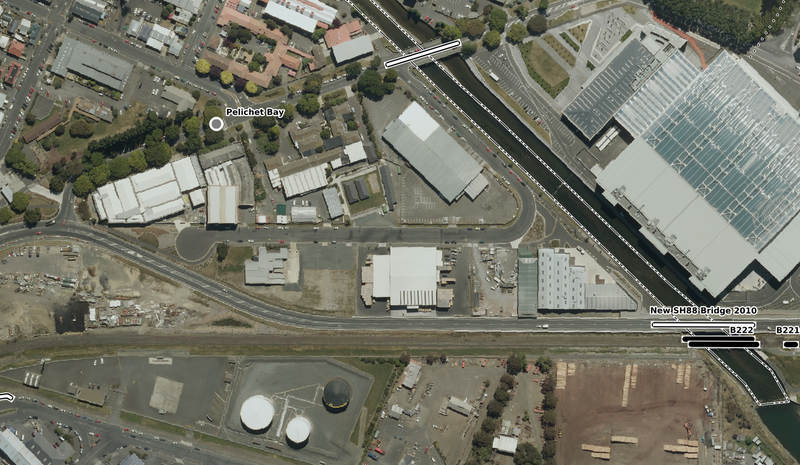 So here are some photos of the area around Dunedin Station from this survey. 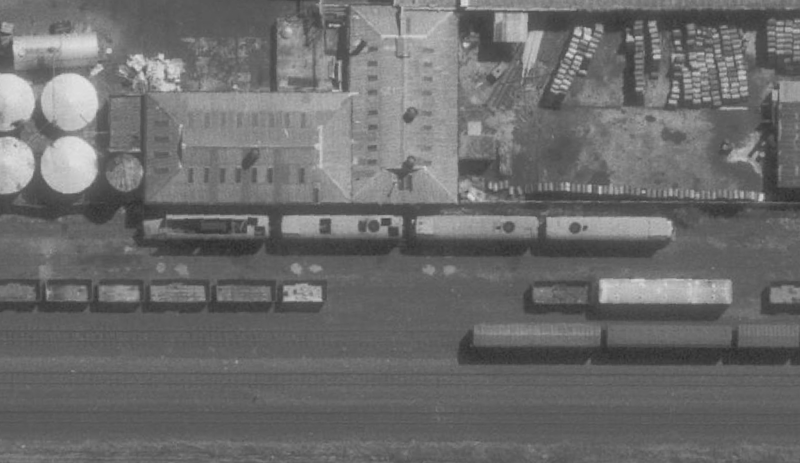 The station with a rake of OETT cars at the main platform. This was a Sunday, so there may have been an excursion going out on this day. 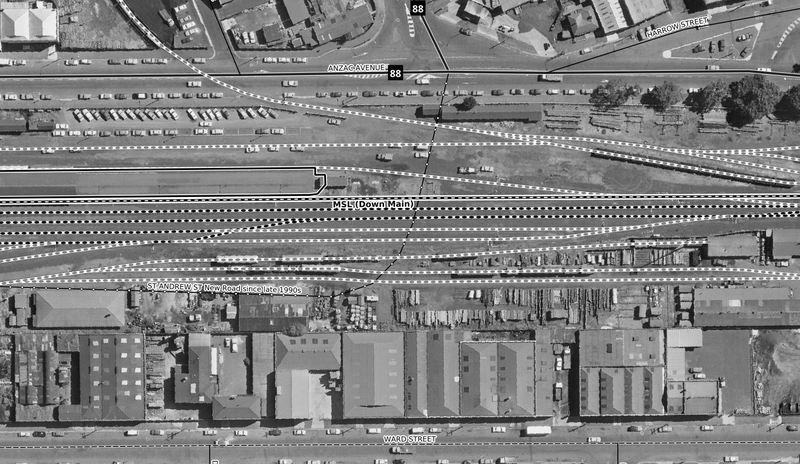 Before OETT had the use of the Gully they occupied sidings at the north end of Dunedin station. 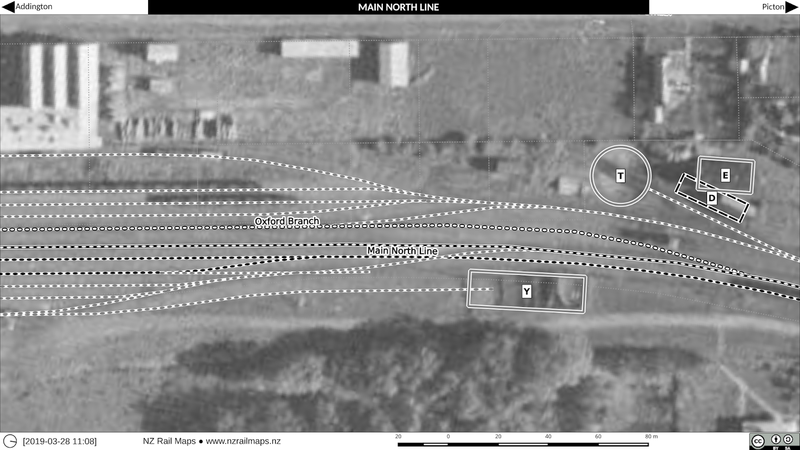 These three images show the sidings with various items of rolling stock. 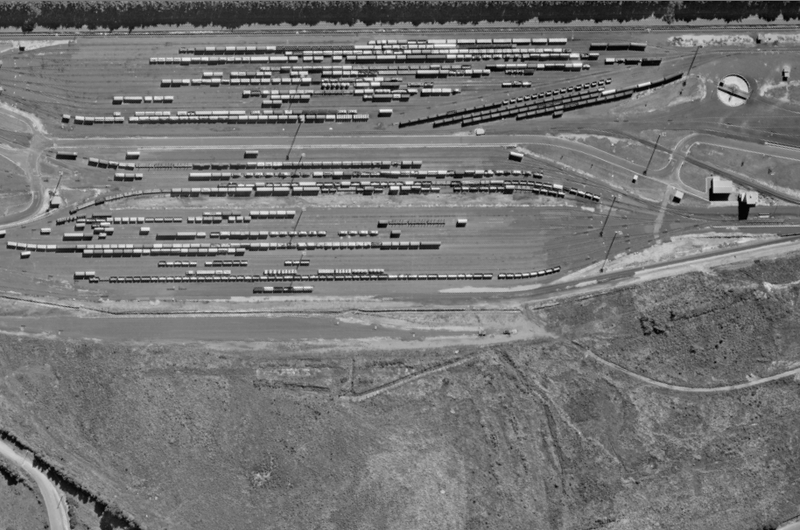 These include the carriages that were under construction for the Taieri Gorge Limited at the time. Dunedin-Mosgiel map mosaics have been completed with the addition of historical maps of the Mosgiel area. After this was done, the entire set of mosaics was reviewed and it was found three more pieces needed to be added in Dunedin. 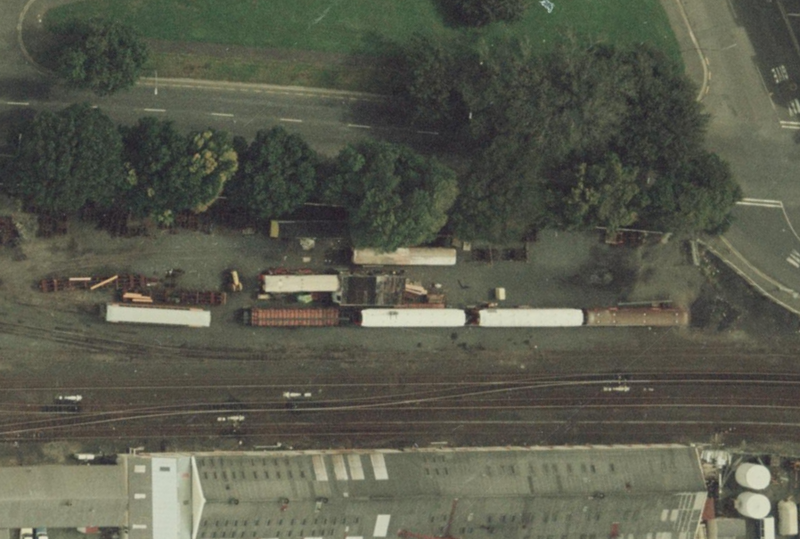 These were near the Water of Leith railway bridge where there were gaps in both 1972 and 1942 coverage, and a 1942 map of the route of the Dunedin Peninsula & Ocean Beach Railway line (not the current OBR line). 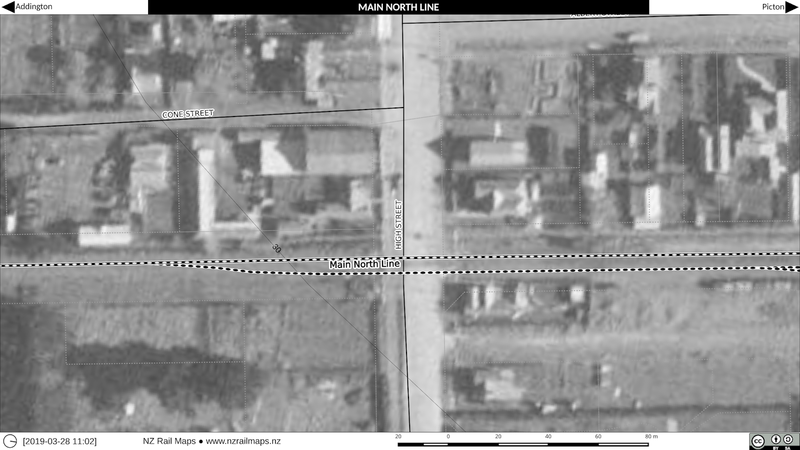 Mosgiel includes the first part of the Outram line which was a siding to the woollen mill. 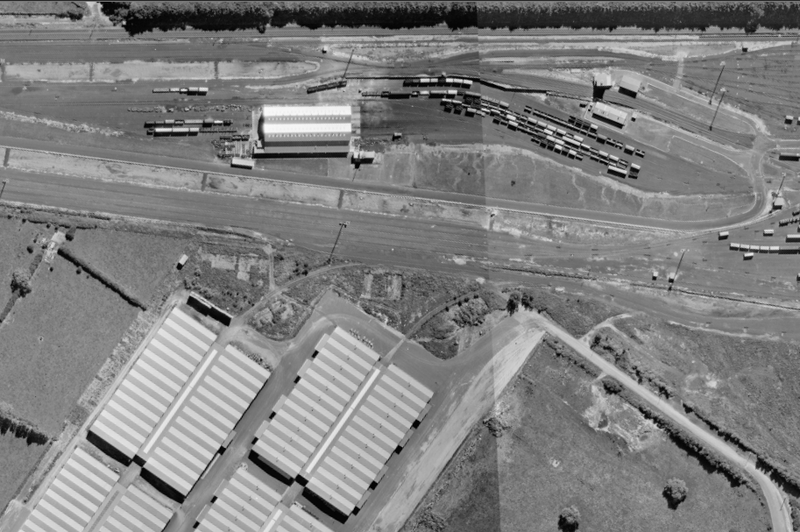 In 1966 when the aerial photos were taken this siding was still in use. 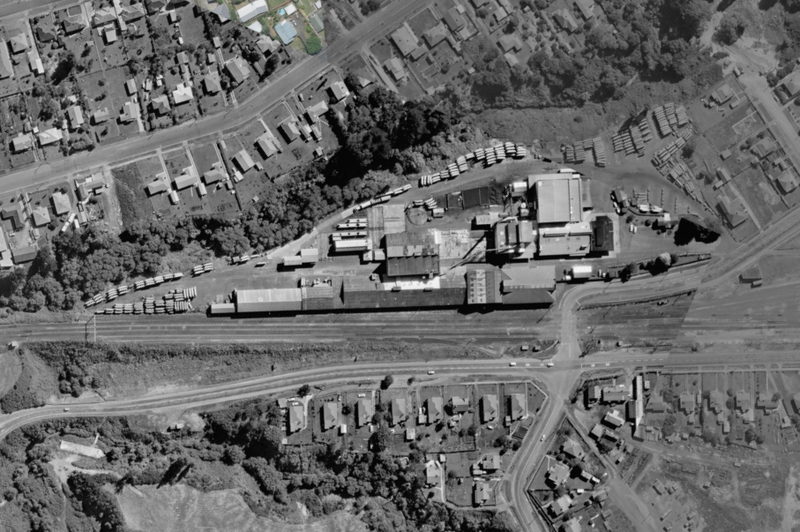 This seems to have ceased by the early 1970s, by 1975 the siding had been lifted back to the first bridge, which was on the first curve where it turned 90 degrees from the MSL to run up into Mosgiel. 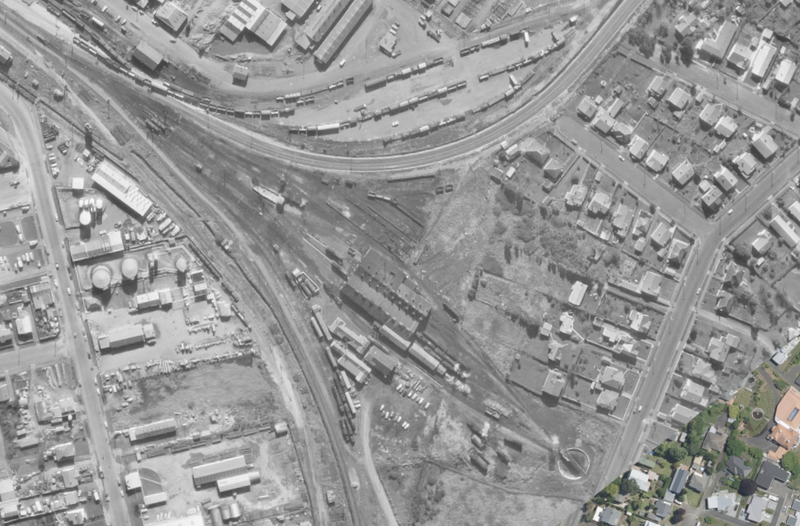 I did consider putting the Outram Branch into this project using the 1942 aerial photos but decided to leave that for a separate project that will cover the whole branch sometime in the future but it will not show much detail of the stations as the 1942 aerial images are not particularly sharp. 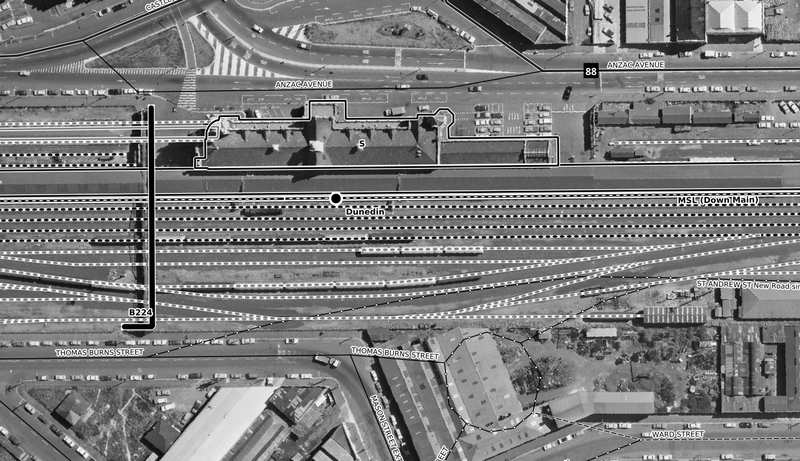 I previously had Caversham in 1942 coverage (and have tiles for it that I produced from an earlier version of the project) but decided to remove this because sufficient pre-motorway coverage is available around Caversham from the 1970s. 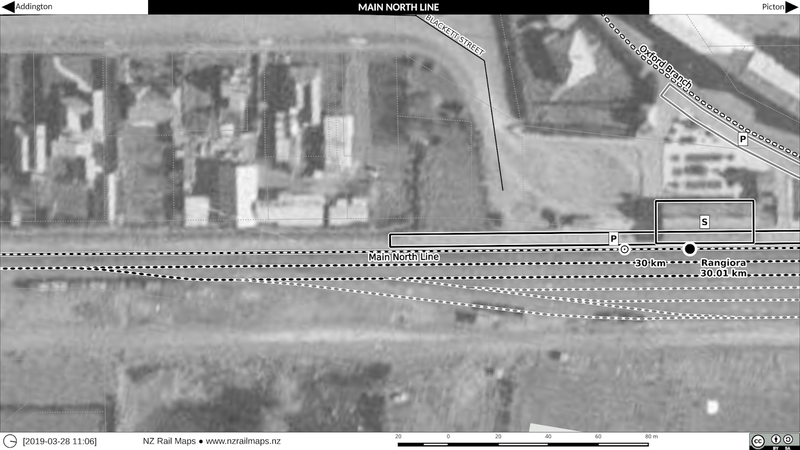 1942 coverage generally is not sharp enough to be of much use and for the maps has been limited to a few select areas of specific interest. 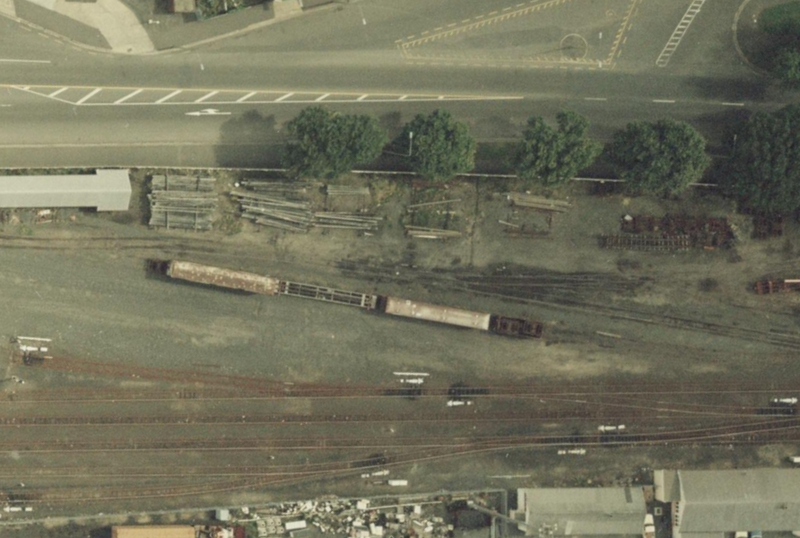 These are Dunedin yard, the routes of the DPOBR Walton Park and Fernhill branch lines, and Wingatui which had industrial sidings that were gone by the 1970s. 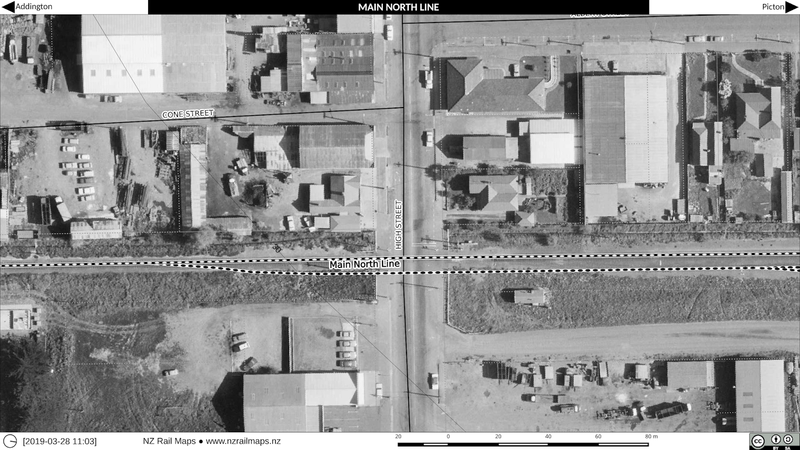 In most cases these images are too blurry to have much usefulness for mapping. For all other areas, the earliest coverage used (only in some areas) is from the 1960s. 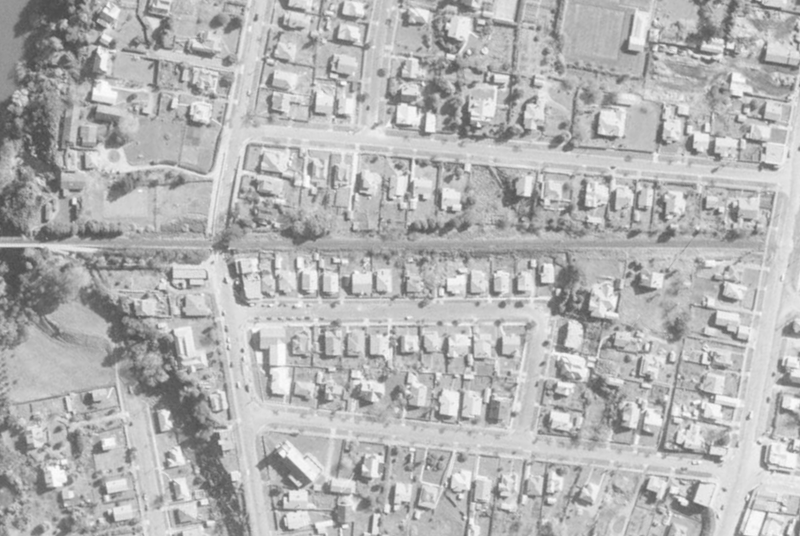 The main interest for having coverage of any areas before the 1970s is, as alluded to above, the desire to show what Dunedin looked like before the southern motorway was put through, all along the rail corridor, which in particular around Caversham was diverted and singled. 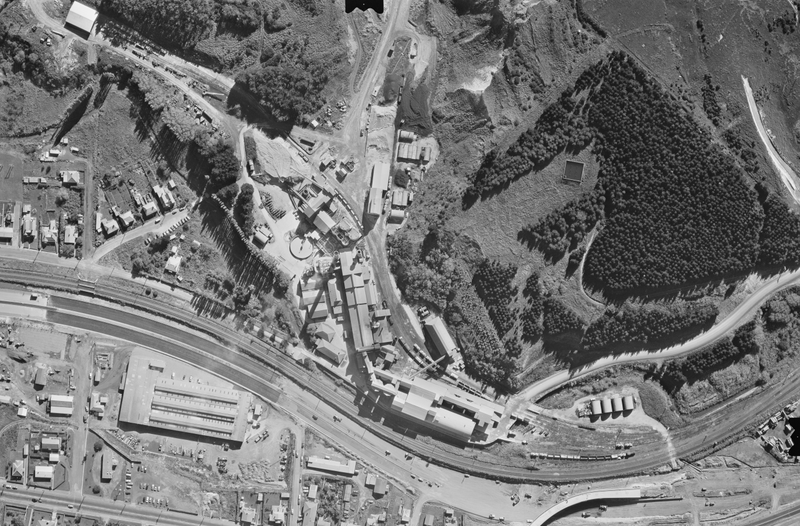 South of Dunedin most stations have changed little over the years and there is no real need for coverage before 1960. 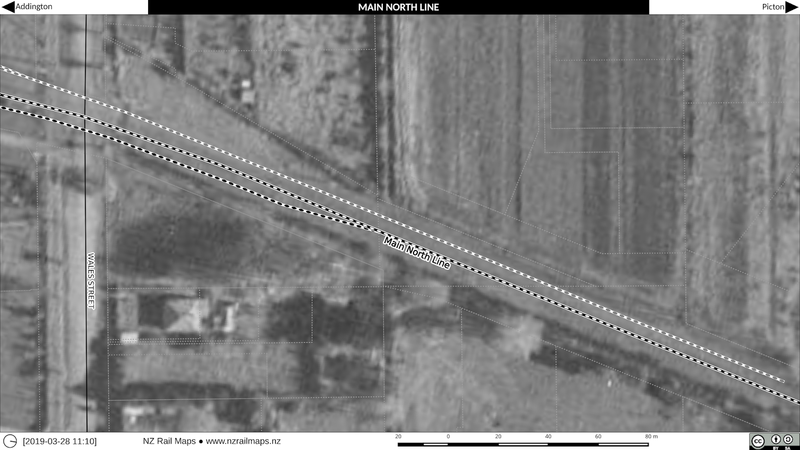 Although it is hard to find coverage at a good resolution pre-motorway between Kensington and Green Island, a combination of 1978 and 1960 surveys that have been located will give a reasonable view of the area. 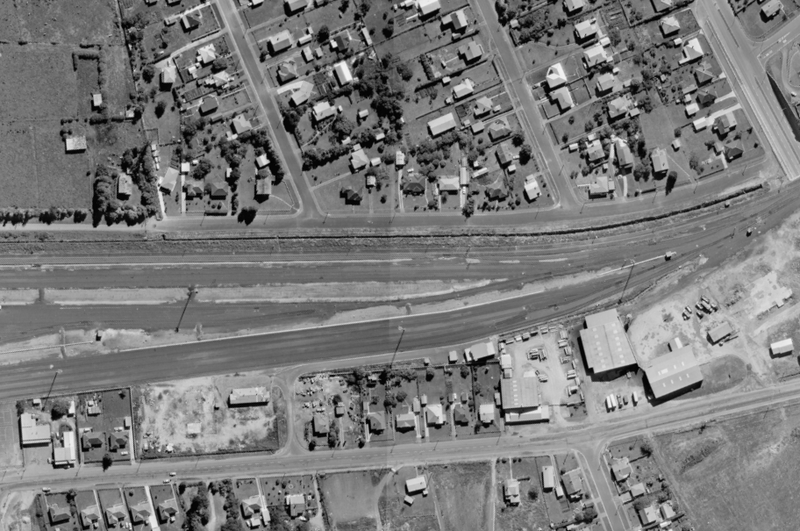 The motorway works started at the south end of Dunedin (Green Island etc) in the early 1970s and at the middle (Kensington) in the late 1970s and finding aerial coverage that is of good enough quality is hard as 1942 is not very sharp. 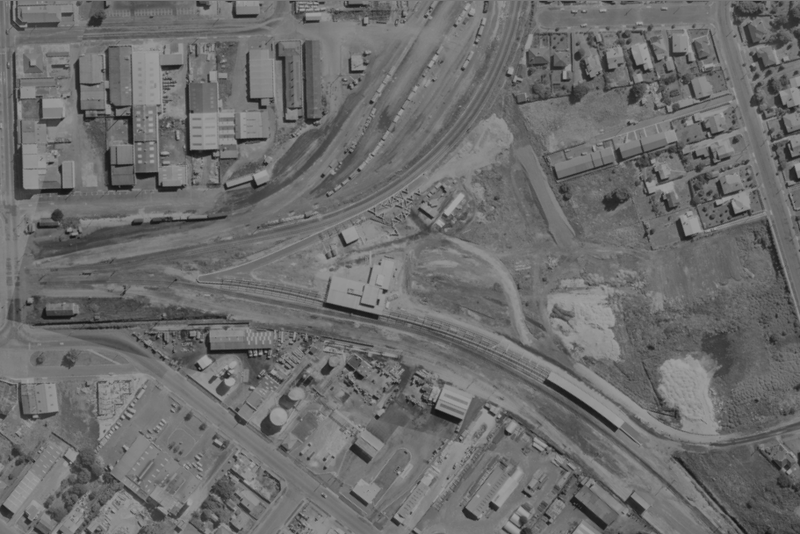 It's only been included of Dunedin station for historical interest of a major yard in the middle of the city. 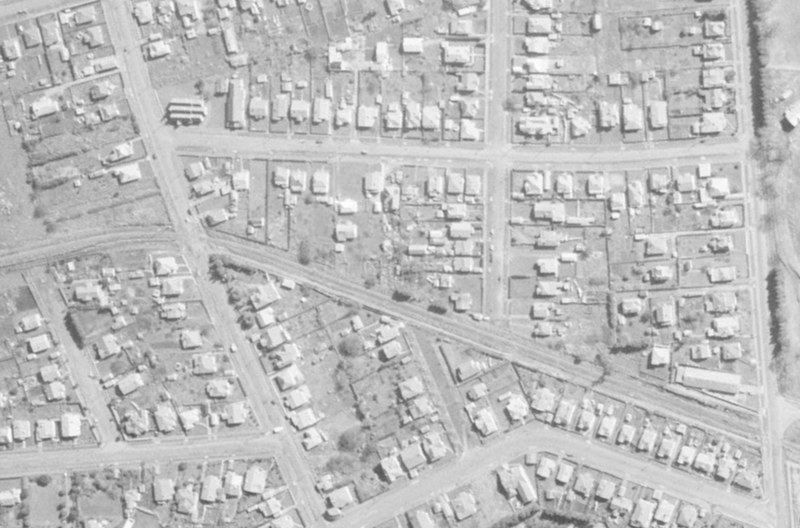 1942 general aerial imagery of Dunedin. As much of NZ is covered by these series they were probably intended for military purposes. Survey numbers are in the 200 range. 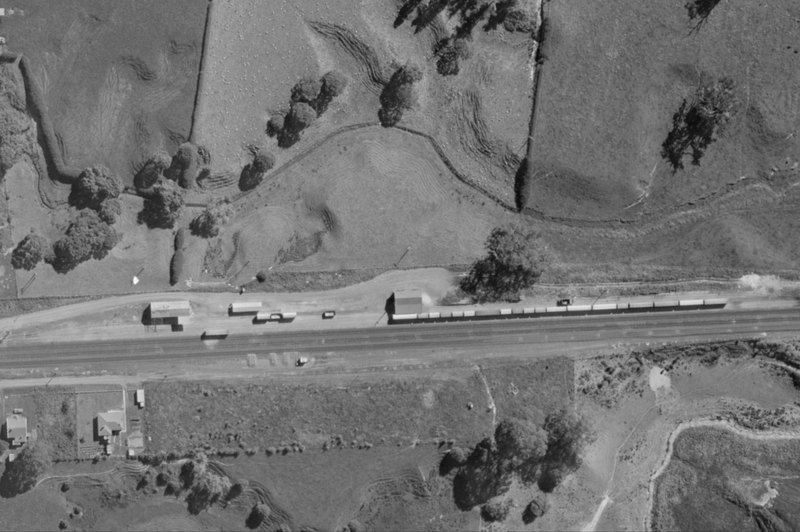 1966 State Highway 87 District 17 - Mosgiel. This is survey no. 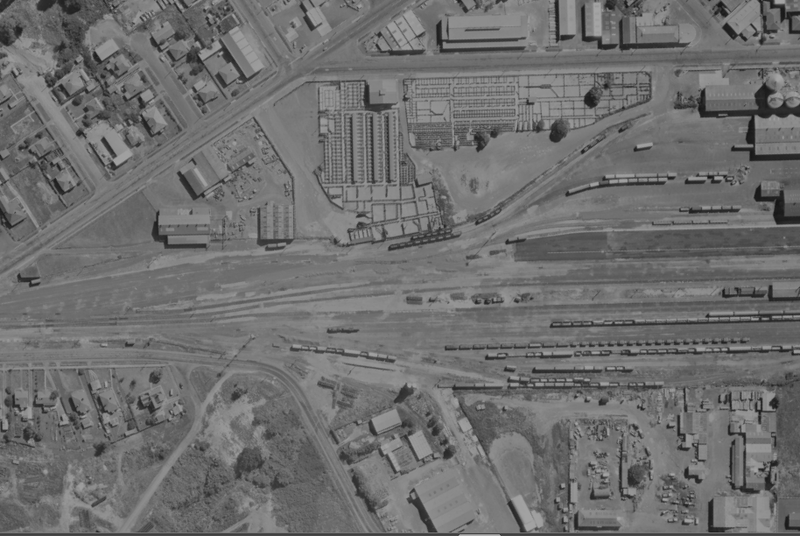 1915 which happens to cover some stations up the Otago Central Railway (as SH 87 runs from Mosgiel to Kyeburn where it joins the Pigroot - SH 85, and thus close to the OCR from Sutton to Kokonga). 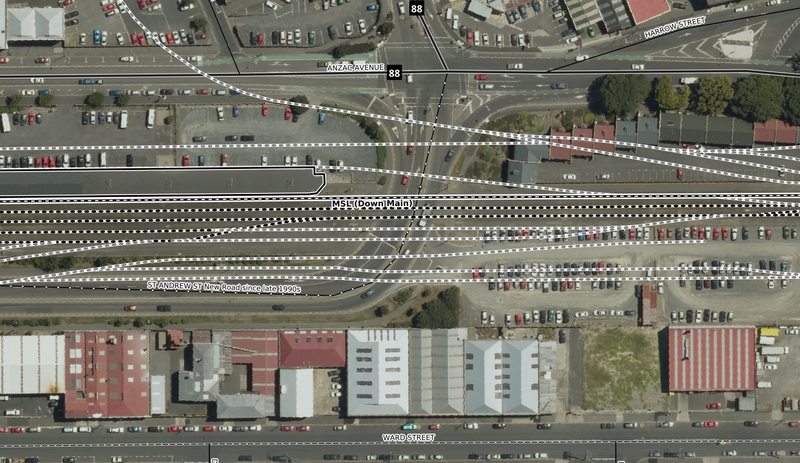 Most of the other surveys were done specifically for NZR, for the various stations in Dunedin (Caversham and Abbotsford did not have these surveys done). There is a large survey done for NZR in 1978, no. 5248, which covers the entire MSL from Palmerston to Mosgiel. I am downloading every image in it for future reference because it means I can map every station in that section and that might be the next big set of map mosaics done. But that will depend on how long it takes to assemble such mosaics. Tomorrow therefore I will have the ability to start extracting the tiles from the mosaics to be mapping all across the area. The mosaics out of interest were all in one file, which reached a peak size of 53 GiB before it got too difficult for my computer to handle (running out of SSD swap space which slows Gimp down a lot swapping to the hard disk and seems to make it more unstable). At that point it was split into two files. 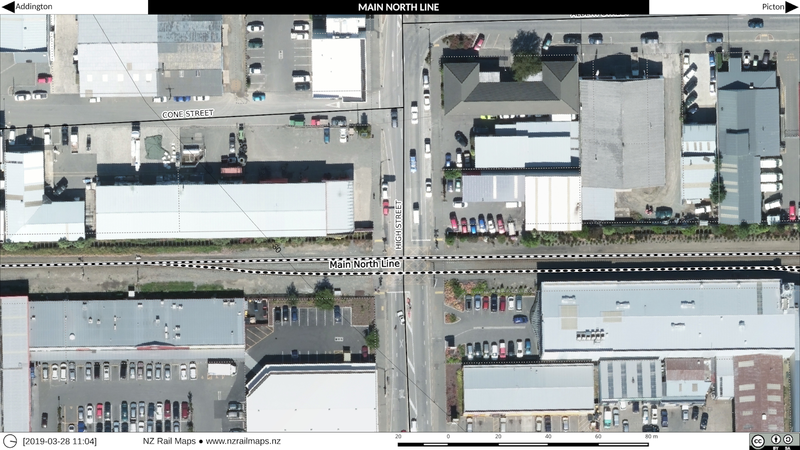 This is a quick update to show where we are up to with the Dunedin to Mosgiel mapping project I am undertaking at the moment. 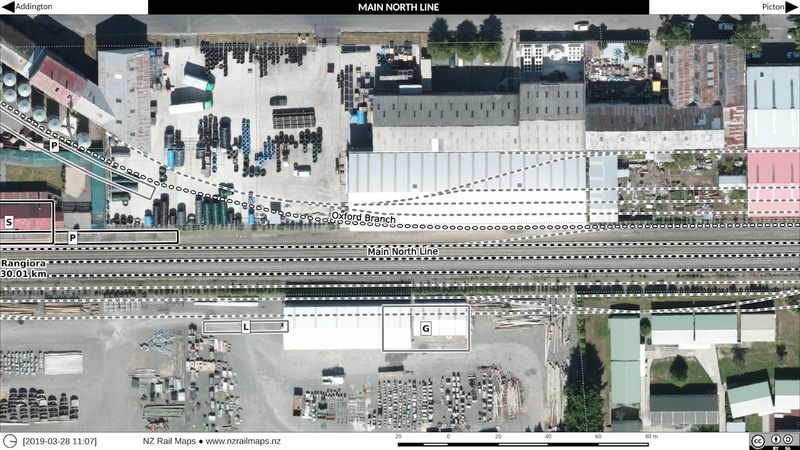 This is getting to be fairly comprehensive, bringing together maps that incorporate quite detailed coverage of practically all of the stations along the routes, as well as older historical views of the Fernhill and Walton Park lines. 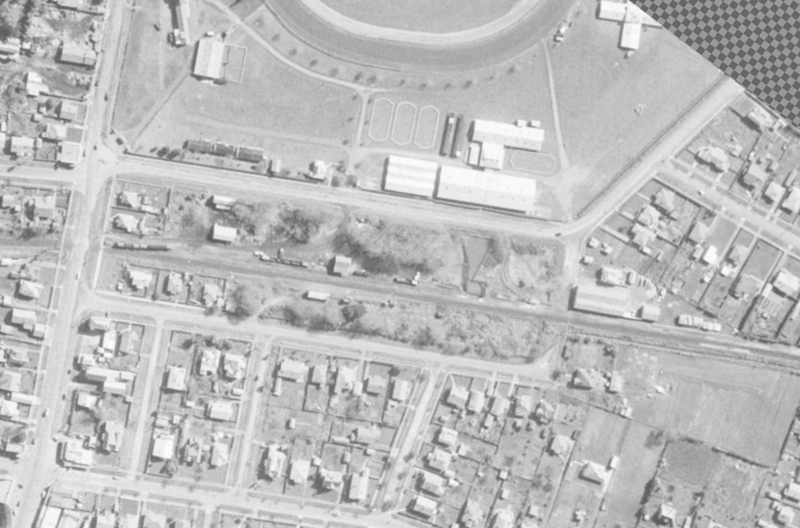 I am through to Abbotsford with the aerial photography at the moment, and as there is no NZR coverage of this station specifically, I am going through other aerial collections to see what I can find that will give me some reasonable detail of Abbotsford. 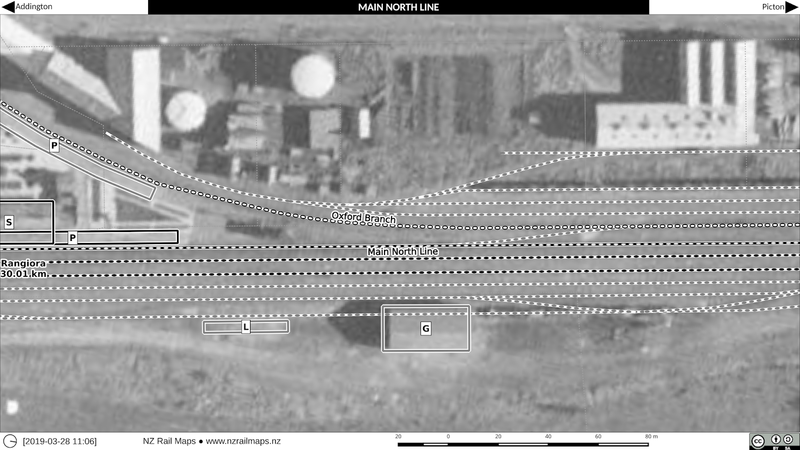 As you can see in the below there is great coverage of a lot of the railway siding served sites around Burnside and Green Island for example, here is the freezing works at Cattleyards and the cement works at Burnside. 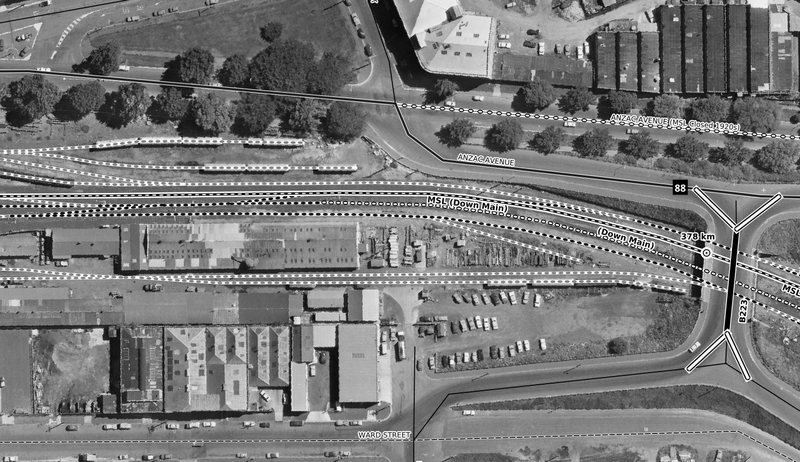 Rangiora is the major intermediate station in the former tablet section from Addington (Christchurch) to Waipara (junction of the Waiau Branch). 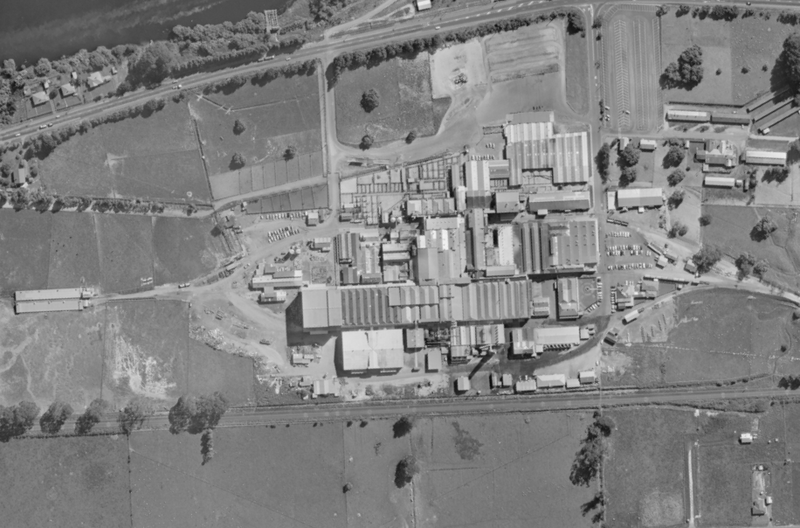 It is also one of the largest towns in rural North Canterbury. 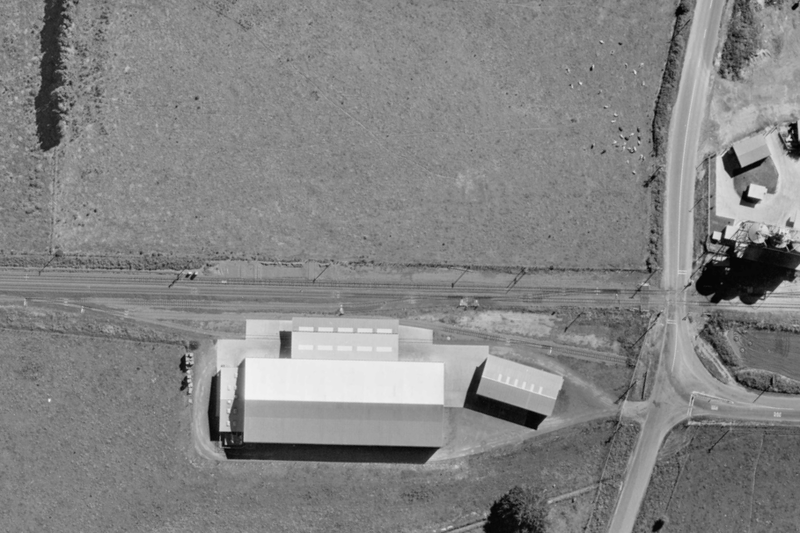 It is 30 km from Addington, almost exactly halfway between there and Waipara. 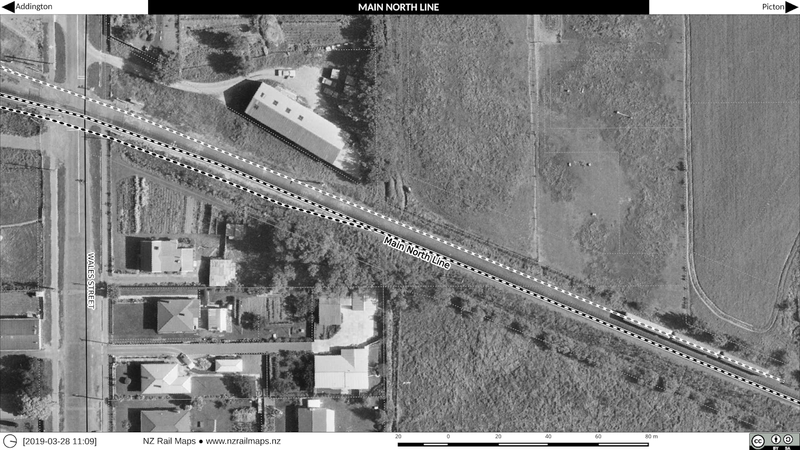 The Great Northern Railway from Christchurch reached Southbrook, 3 km to the south, in 1872, and was then in the broad gauge of 5 feet 3 inches (c. 1600 mm). 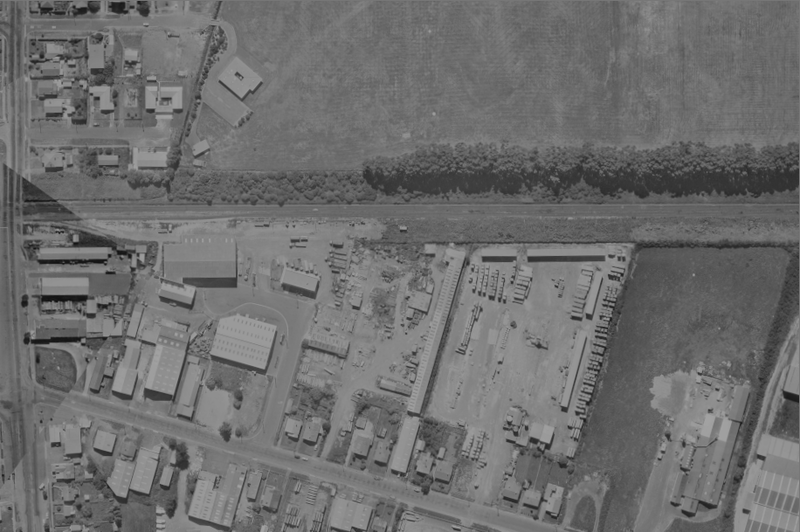 It was opened to Ashley (c. 3 km north of Rangiora on the north side of the Ashley River) in 1875, then to Balcairn in the same year, and to Amberley in 1876. 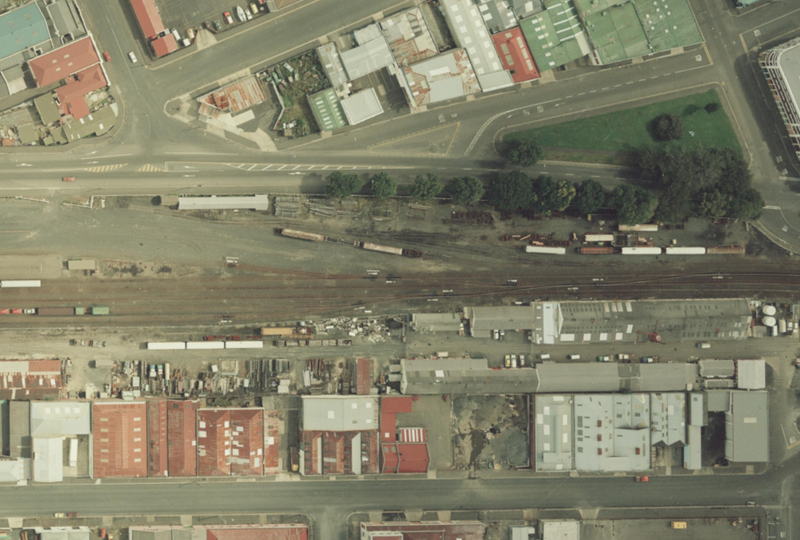 This was the maximum northern extent of broad gauge in Canterbury, and it was converted to the NZ standard gauge of 3 feet 6 inches (1067 mm) in 1878. 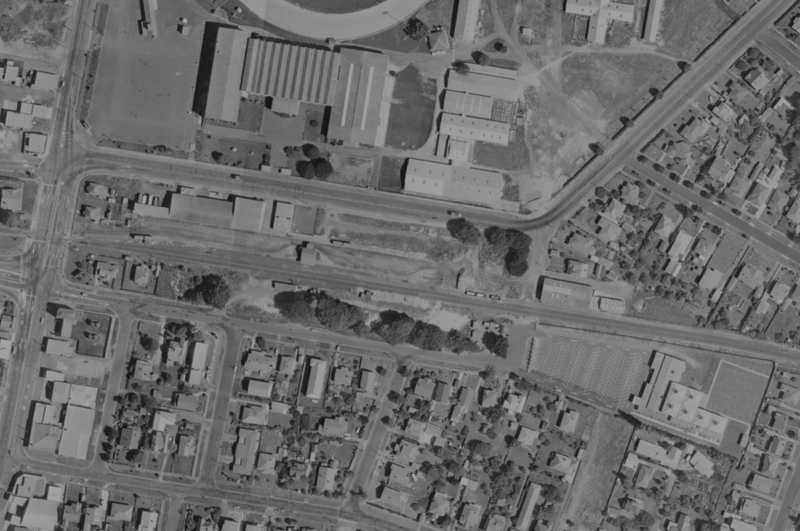 Rangiora was from 1874 to 1959 the junction for the branch line to Oxford, which from 1884 to 1930 had an extension to Sheffield (a station on the Midland Line) via the Waimakariri Gorge bridge, which is still in use today as a road structure. 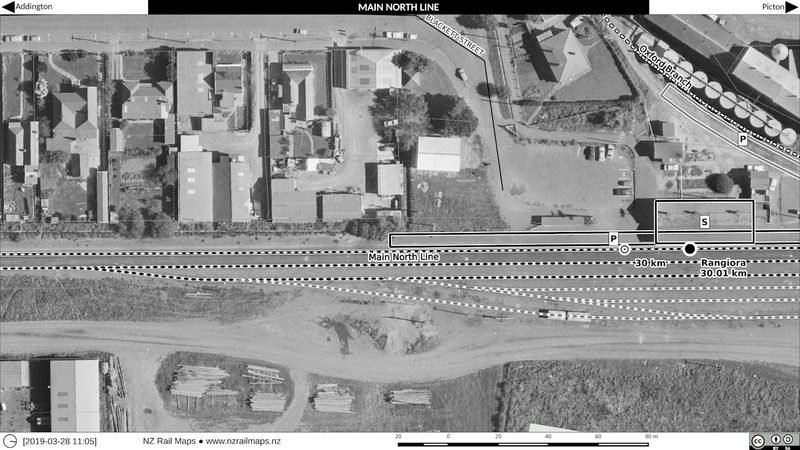 The Oxford branch line also joined at Bennetts Junction with a line from Eyreton (Kaiapoi) that was first opened in 1878 and progressively closed between 1931 and 1965. 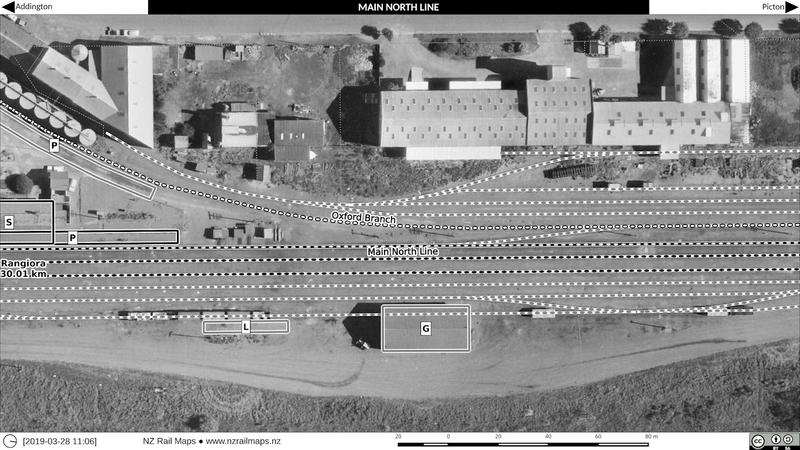 The working of these branch lines required a locomotive depot at Rangiora and the turntable used to turn the steam engines remained long after the end of branch services into the 1970s at the north end of the station yard, while an engine shed was closed some time earlier. 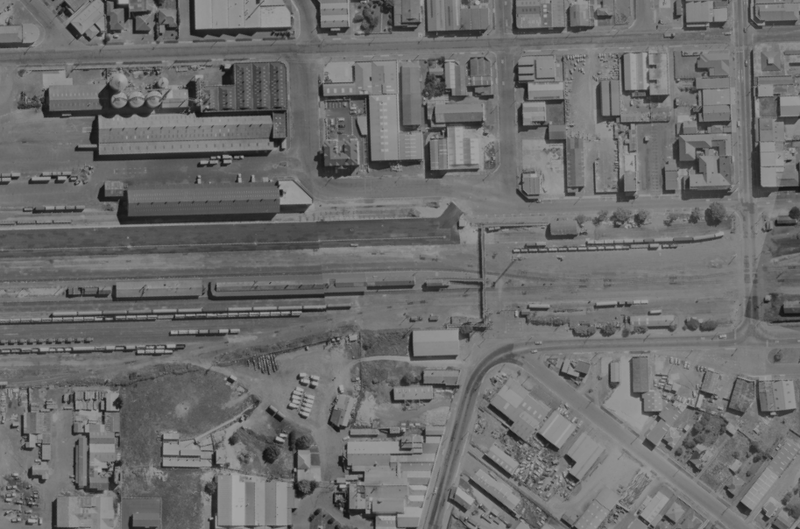 Rangiora's passenger station has been at its present site for decades. 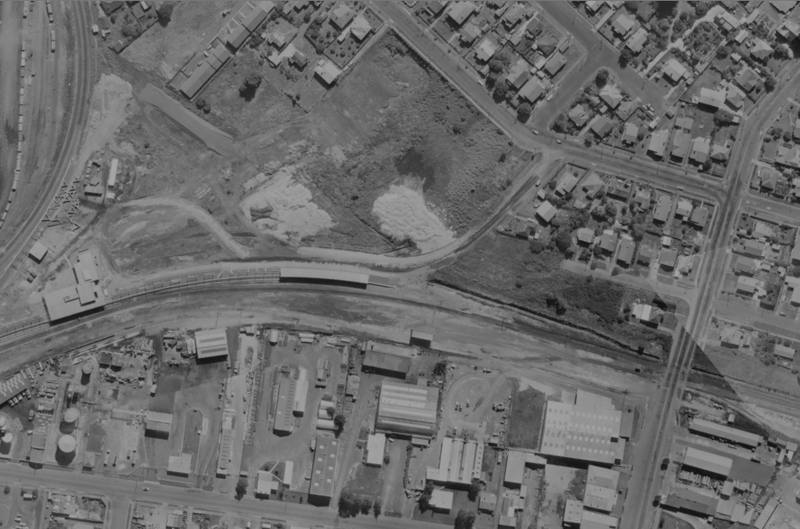 A branch train platform behind it was still in place in the mid 1980s, but seems to have been demolished about 30 years ago. 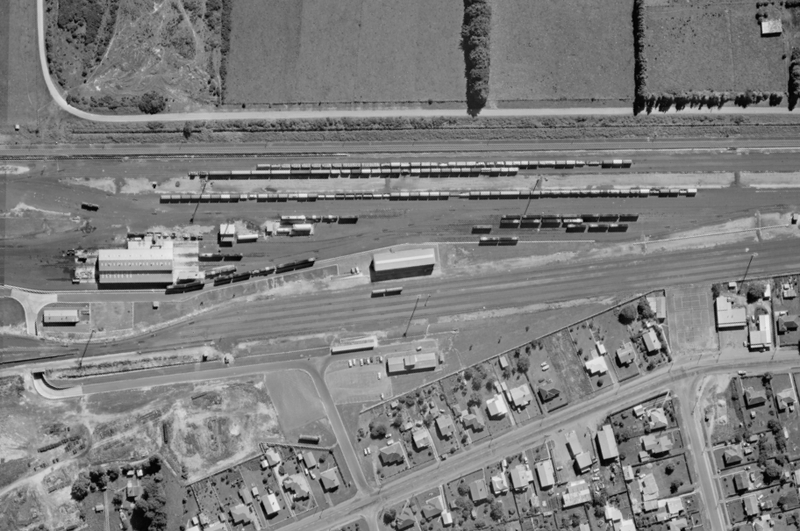 The importance of freight traffic at Rangiora can be seen in the extent of the sidings, nearly all removed including several private spurs on the west side. 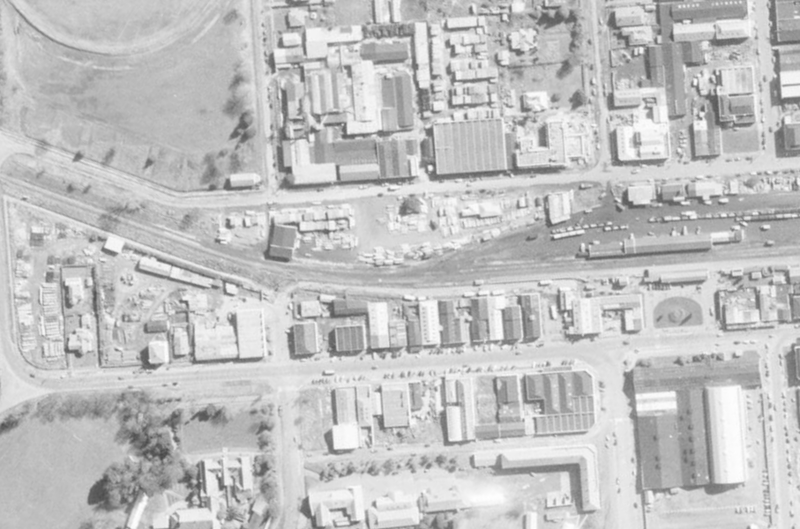 Rangiora's main importance today is as a passenger halt for the Coastal Pacific service, and for crossing freights. 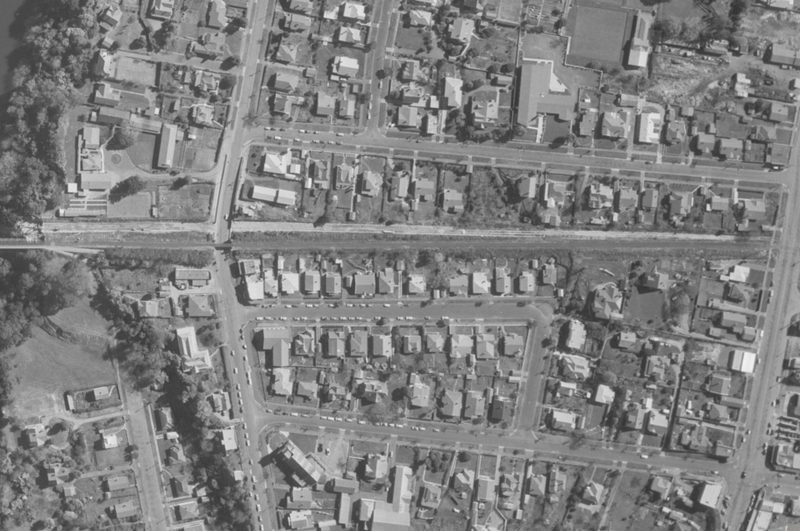 The aerial photos are in sequence from 1942, 1975 and 2014.